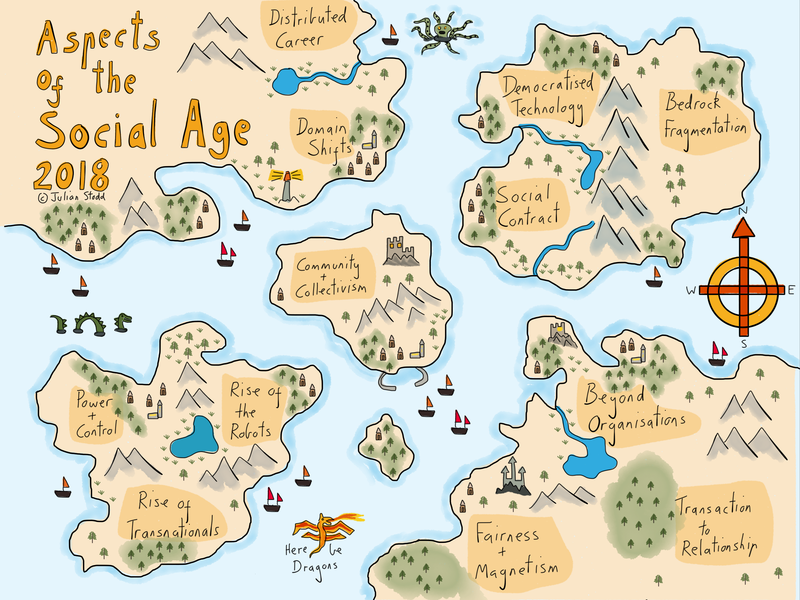 The Social Age frames an existential threat for many organisations: they have grown up in a known world, with established frames of education, career, economics, and power, and now find themselves alienated from all of those ideas. Our new world presents the foundations for a new world order: evolved models of identity and social organisation, evolved models of retail and healthcare, evolved models of technology and connectivity, even evolved models of nationality and politics. Much of my work explores this space, not to give answers, but an attempt to characterise, and understand, at least at a cursory level, the new space we operate within. My own picture is far from complete, but one thing is clear: this is a systemic, existential, change. Almost everything has changed, and not simply in the trappings. Take power: we move from a world that was largely dominated by structural power, imbued into systems of politics, organisation, broadcast, and finance, typically patriarchal in nature, into a world of disrupted, rebalanced power, with the concurrent rise of social communities, disruption of gendered power, and proliferation of democratised alternatives to structural control. I try to sketch this every year, and every year the map evolves, because this change is accelerating, and often beyond our immediate vision. And yet it is impacting everything we do. Change within a known system is about the rebadging of known space: new shops on a high street just reflect an evolution within a known space. Much of the change we see today is disruptive, fragmentation of the bedrock we are built upon. Blockchain does not just compete with banks, it’s an existential threat to codified and geolocated financial power and control. And it also disrupts formal hierarchy: as reputation networks are codified into new blockchain based recognition networks, they are able to subvert and bypass established structures of power. Much of the change we face, in almost every sector i can think of, occurs outside known norms. And to face this challenge will require systemic change. I smile as i wrote this, because of a conversation i had earlier today, about how i needed to understand that, in the everyday reality, many organisations are too busy dealing with the real problems of today to even consider the structural change necessary to face tomorrow. They are right in that viewpoint, that we are all busy. But wrong in two other senses: firstly, it does not matter what i think, because i am not responsible for the pressure. It’s the pressure of an ecosystem change, which will impact us, like global warming, whether we choose to believe in it or not. And, secondly, the decision of whether to change today or tomorrow is largely moot, because the study of failure teaches us that those organisations that fail, typically fail long before they recognise their failure. They are, essentially, failing today. I recognise that this may sound like a disparaging view, and apologise for that, but we cannot deny the evidence: the nature of the challenge we face is endemic, and systemic. And it’s facing us right now. More positively, we do not need answers. At least, we do not need answers today. What we need to be doing is opening our minds, and building our communities, to make sense of the change, and to prototype new ways of adapting to it. 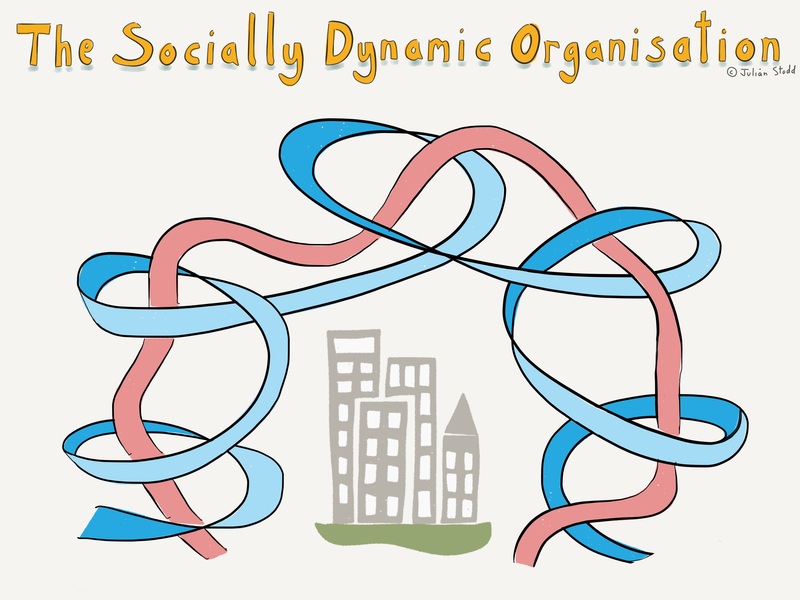 In my own work, i consider the notion of a Socially Dynamic Organisation: one that is adapted. I do not yet fully know what this will look like, and indeed find that many of my earliest ideas are swept away by the evolving understanding of the challenge itself, but that itself is valuable. It’s better to do your wrong thinking early, and to do it in good company, than it is to assume, or bet upon, the fact that you will have spontaneous and emergent brilliance later in the process. It may sound pedestrian, but i strongly believe that we have to edge our way towards success, we have to earn our brilliance the hard way. We have to take the long road. Consider power: the Social Age presents us with fundamentally disrupted models of power and control. As the boundaries between formal, and social, spaces are fully disrupted by technology, we see groups who operate outside of any formal system organising, collaborating, and claiming a community moderated form of power, which often stands in opposition to intractable established models. Just look at the #MeToo movement, which stands to achieve the unthinkable: the unseating of patriarchal power. At a hyper-local level, the reputation which we forge into our local tribes and communities can now be carried to a macro level, to a global one even, through the amplification effects of high functioning social communities. Generally speaking, social systems are ascendant, and much of the power that they claim comes at the cost of formal systems. But i should be clear: we need both. There is a Dynamic Tension between the two, but it is through, and because of, that tension that we will find our strength. 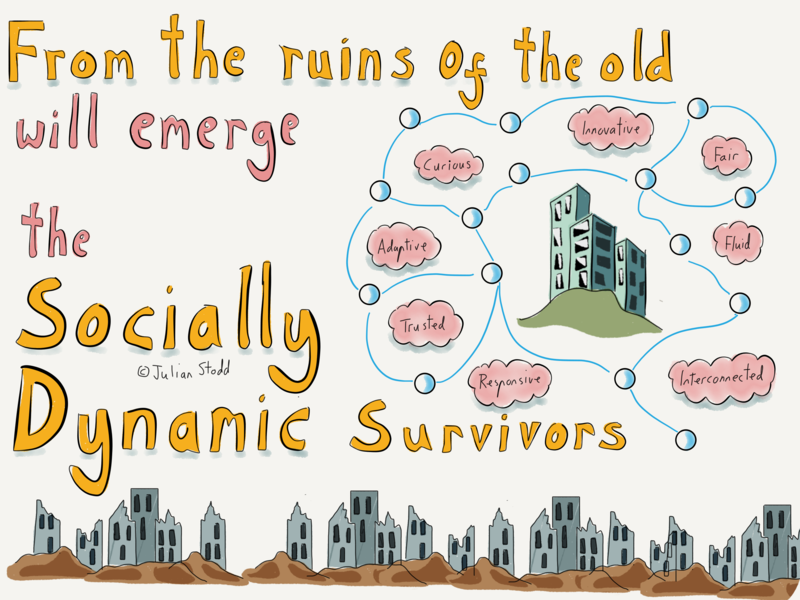 The Socially Dynamic Organisation will have great formal strength, because that is what it needs to operate at scale within the known systems, facing known challenges, and within established models of organisational design and control, but it will also have great social strength, because that is what we need to evolve the known system, to innovate, to face unknown and emergent, often asymmetric, challenge, and to subvert outdated models of organisational design and control! 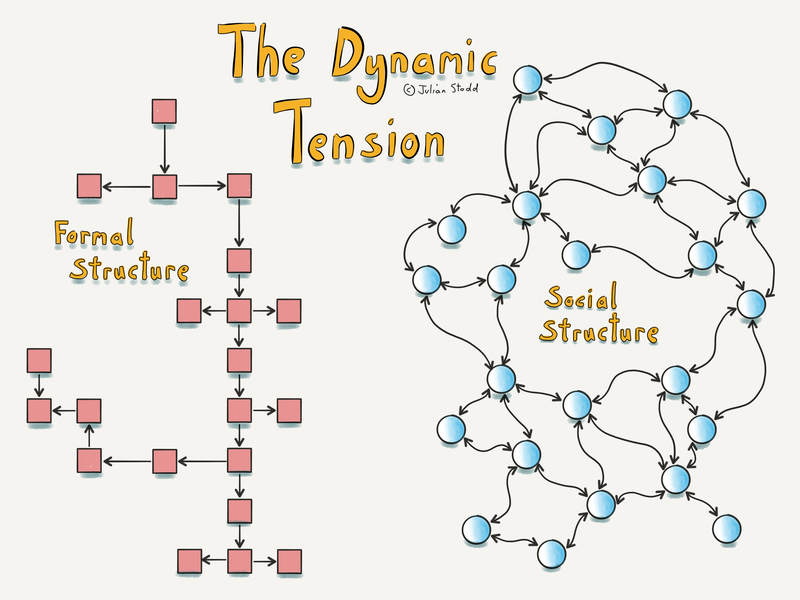 If we earn it, if we are willing to exist in the shadow, of this Dynamic Tension, then we may earn the right to build a new type of Organisation. And we have time to do this, if we lay down the foundations today. Whilst i see that many of our existing organisations run the risk of failure, that failure is not assured. If we have the humility to lay aside parts of our established power, if we have a willingness to surface, and learn from, the unheard, untapped, wisdom of our community, if we are willing to relinquish aspects of our formal control, in favour of the power of our distributed community, then we stand a chance of building a new type of organisation. And build it we must. 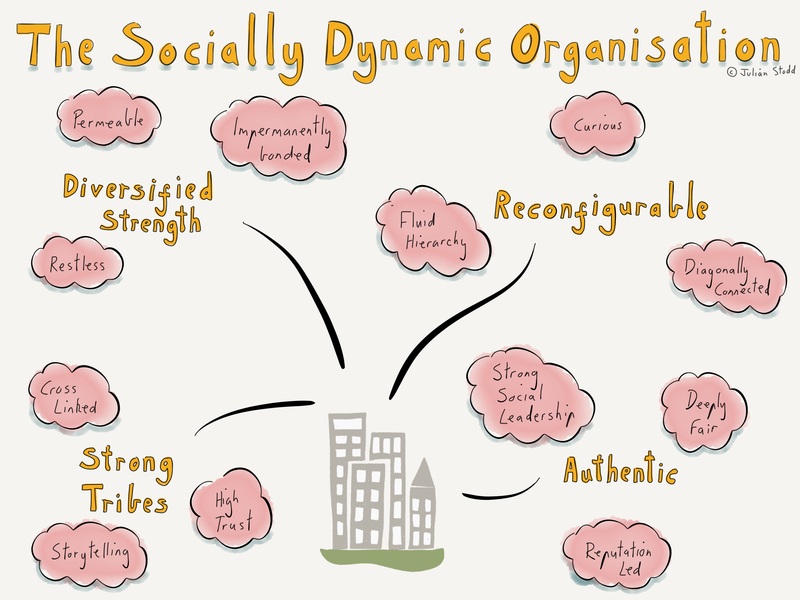 Nobody will give us the Socially Dynamic Organisation: it will not be bought from a consulting company, or delivered to us by our senior leadership alone, it will not be acquired through great wealth, or discovered without great effort. The best we can do is to create the conditions by which we may uncover it, the conditions for success to emerge. And when it does, it will likely be discovered by us all, working together. 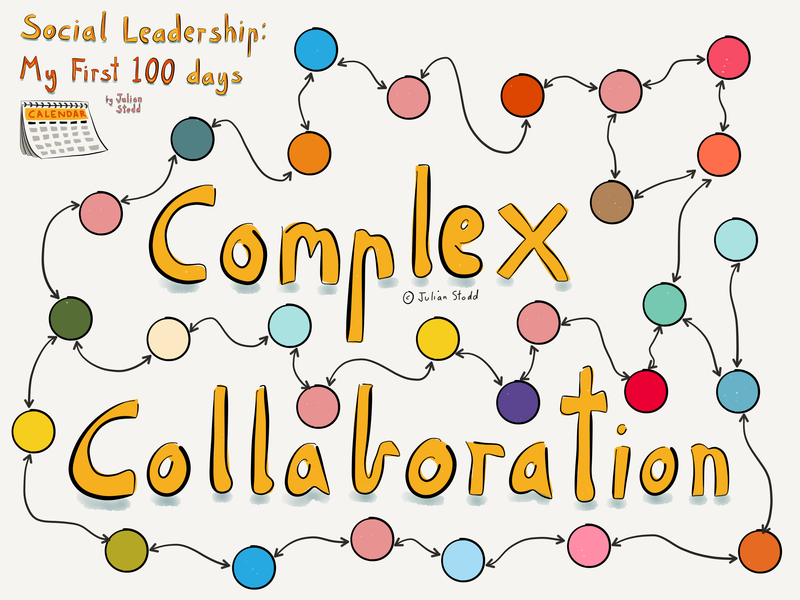 Collaborating, not in simple ways, but in complex ones. Not within silos, but as one, interconnected, system. 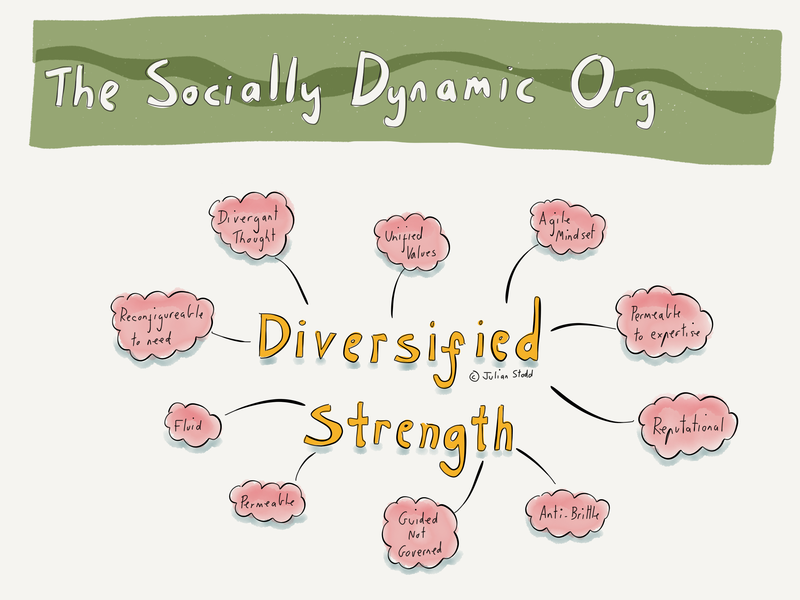 The Socially Dynamic Organisation will hold a diversified strength, a strength that comes from an engaged, and empowered, community. The strength will lie in the individual agency, unconstrained, and generously pledged, from a distributed community. It is a type of power that we can only earn. It cannot be demanded. We live in an Age of Engagement: given the right opportunity, the right systems of recognition and reward, people will engage. But it will likely be engagement beyond the bounds of contract. It will be engagement upon a foundation of trust. It is most certainly an earned reward. Individual agency is the micro engagement of every individual, scaled up to global. We can help to bring it about through structural engineering: by changing the formal aspect of the organisation, but we cannot deliver the whole thing through engineering alone. 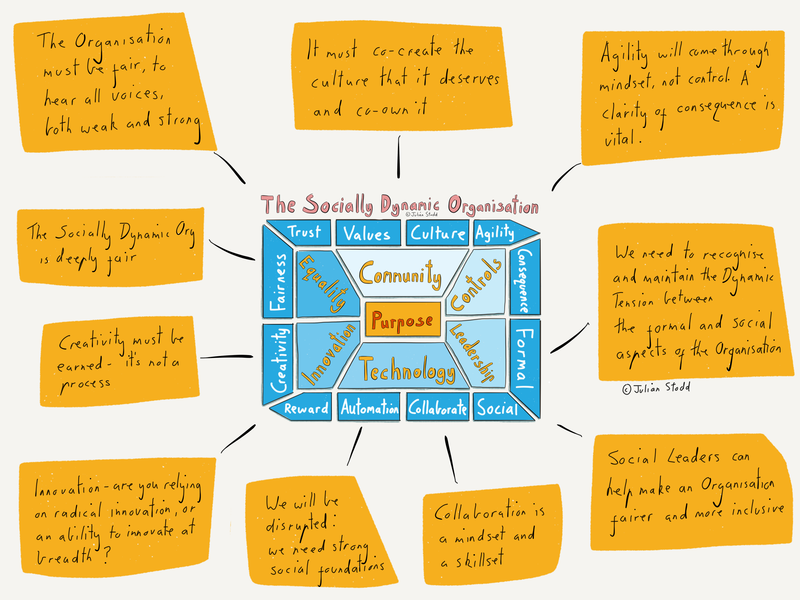 Part of the Socially Dynamic Organisation is built, and part of it is earned. The interconnected, the meta-tribal structure, is part of the new modes of social organisation enabled by this democratised technology. And it’s very real. A strange phrase to utilise, but i do so deliberately. Much of the structure of organisations today is a fiction: made up over a hundred years of scientific management, taylorism, and the accretion, and codification, of structural power. But it’s fake. We exist, at a human level, within communities. We exist in complex social structures. So the Socially Dynamic Organisation will have to reflect this. Sure, it will have tidy and formal structures of formal power, but it will also have complex and invisible structures of social authority. 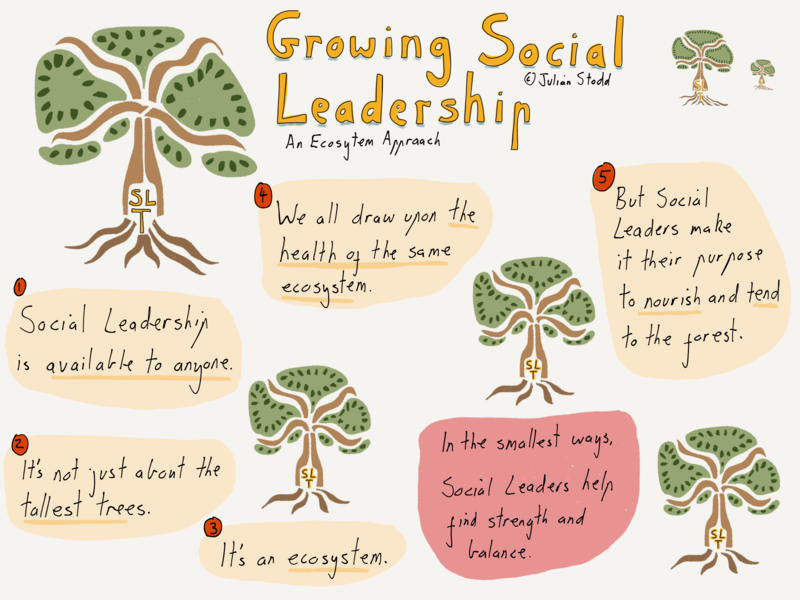 And it will have a specific capability in the shape of Social Leaders, who help us to interconnect the two. It is, at heart, a system in balance. Great formal, and great social, strength. We do not need to have this strength today, but in the context of the Social Age, against the backdrop of current disruption, and under the shadow of disruption yet to come, we need to be casting our eyes around, considering how we will build a new type of organisation. An organisation that can thrive in the the evolved reality of the Social Age. 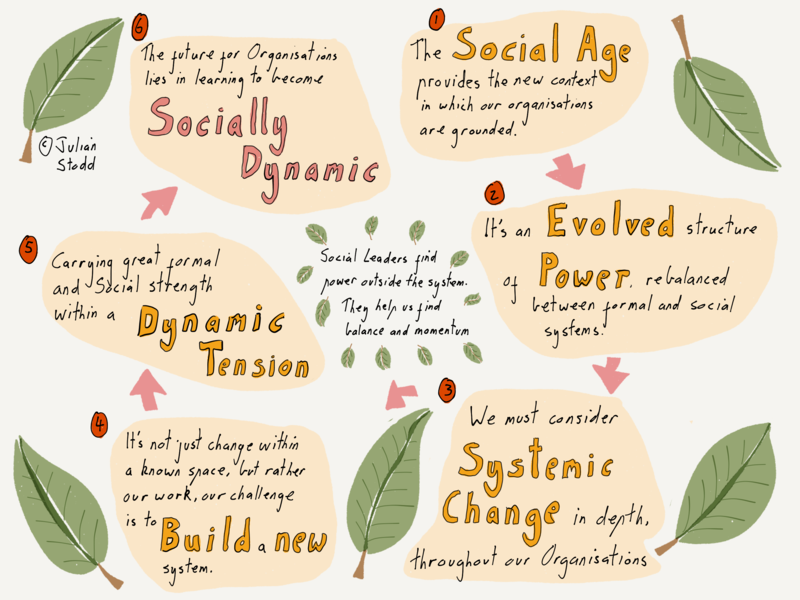 This entry was posted in Social Leadership, Socially Dynamic Organisation and tagged Change, Disruption, Social Age, Social Leadership, Socially Dynamic Organisation. Bookmark the permalink.